I don't see very many movies lately. Most of them just don't appeal to my "increasingly disenchanted with pop culture" self, but Saving Mr. Banks is one I looked forward to from the moment I first saw the trailer. Saving Mr. Banks is the based-on-a-true-story story of how P. L. Travers' children's books came to the big screen. Walt Disney's daughters begged him to make their beloved Mary Poppins into a movie. He promised he would, and after twenty tumultuous years of trying, he finally got the uncooperative Travers to at least come talk to him about it. Her sessions with the Sherman brothers, the ones who wrote the delightful music for the film, were great. In real life, she insisted on having them recorded, and it's interesting to listen to some of the original Travers recordings played during the closing credits of the film. It's really a miracle that they got anything done at all. But the brothers somehow take their nemesis with a good grace and even persuade her to dance to one of the songs. But, sadly, she draws the line at the penguins. She doesn't mind that they dance (though she does wonder how one teaches live penguins to do so), but when she realizes they will be animated, that's the last straw. She absolutely refuses to have any animation in her film. None. So back she goes to England, refusing to give up the rights to her story and characters. But Walt, determined to keep his promise to his daughters and because, I suspect, he has seen that this truly is important to Mrs. Travers, too, follows her across the Atlantic. He tells her of his own less-than-ideal childhood, and assures her that he understands what her story is about. Not about saving the children, but about saving Mr. Banks. "George Banks will be honored," he assures her in a scene that reduced me to tears. "George Banks will be redeemed. George Banks and all he stands for will be saved. Maybe not in life, but in imagination. Because that's what we storytellers do. We restore order with imagination. We instill hope again and again and again." Those lines really resonated with me. As a writer who has often made her own life bearable by restoring order with imagination, I couldn't help but be touched. And I cried when, after finally giving Disney permission to do the film, Mrs. Travers eventually attended the premier of Mary Poppins, animated dancing penguins and all. And I cried with her when she saw Mr. Banks and his wife and children go kite flying, a happy family at last. 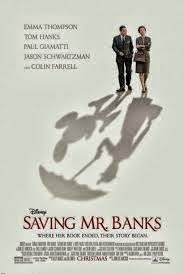 Mr. Banks (and P. L. Travers' and Walt Disney's fathers to boot) saved. Have you seen Saving Mr. Banks? What did you think of it? What's the best movie you've seen lately? This one is on my list when it comes out on DVD. I just watched The Secret Life of Walter Mitty again. It may end up as one of my all-time favorites. I assume you're talking about the recent version of Walter Mitty. I haven't seen it, but if you recommend it so much, I'll have to put it in my Nexflix queue. Thanks for the heads up. I loved this movie so much. I'll be buying my own copy. Wasn't it great? Can you imagine how hard it must have been to please the real P. L. Travers? I am really looking forward to seeing it. Is it out on DVD yet? Thanks, DeAnna. I haven't seen this yet but plan to at the first opportunity. Good to know it's on Netflix as I joined several months ago but haven't watched anything yet - I seem to look for specific movies and they never seem to have it. Now I have to make time and pray we can get it without waiting 20 mins between every 5 mins viewing time. This reminds me of Debbie Macomber when they offered her to chance to make her CEDAR COVE series into a TV series. She said something to the effect that she knew they would change her stories to make them more of an entertainment factor, and that was okay with her because she knew who their target audience was and the whole project was a dream fulfilled - something to be crossed off her bucket list. i so want to see this movie. Disney is definitely in my wheelhouse and I do like Tom Hanks.